Meet the Duke of Mania and the Duchess of Dementia and join their courts. Sheogorath and Haskill awaiting your return. Learn to summon Haskill from Sheogorath. Speak with Thadon and Syl. Complete both of their corresponding quests. Return to Sheogorath to report your success. Speak to Sheogorath, who is pleased at your success in Xedilian and grants you the Lesser Power Summon Haskill. He insists you use the lesser power at least twice before he will assign you another task. After you have humored Sheogorath and summoned Haskill, he will give you your next task: understanding madness. You are to speak with both the Duke of Mania, Thadon, and the Duchess of Dementia, Syl, in order to join both Courts and gain a steady background knowledge about the inner workings of Sheogorath's realm. Speaking with Thadon initiates the quest Addiction. Speaking with Syl initiates the quest The Lady of Paranoia. Complete both quests and report your success to Sheogorath to receive your next task. Haskill is not a fighter and will instead assist you by offering advice based on his extensive knowledge of the Shivering Isles. Continuing to summon him in the palace will cause Haskill to reply with many humorous remarks, ending with "That's enough. Really." An achievement will be unlocked upon completing both tasks. 3 Sheogorath has given me the ability to summon Haskill. He's very insistent and won't tell me what he wants of me until I do it. 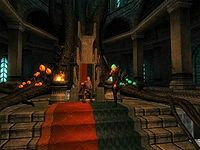 5 I need to report to Sheogorath that Xedilian is working, and that Knights of Order have appeared in the Shivering Isles. 10 I need to speak to the Duke of Mania and the Duchess of Dementia, as Sheogorath wishes for me to better understand the inner workings of his Realm. I have finished Thadon's task. I should return to Sheogorath and tell him I've done as he asked. I have finished Syl's task. I should return to Sheogorath and tell him I've done as he asked. 200 Now that I've become a member of the courts of both of the Dukes of Madness, I should return to Sheogorath and report my progress. It is possible to use the console to advance through the quest by entering setstage SE04Shell stage, where stage is the number of the stage you wish to complete. It is not possible to un-complete (i.e. go back) quest stages. See SetStage for more information. This page was last modified on 16 April 2012, at 22:26.